Why do the baddies always seem to strike at peaceful little sisters who are minding their own business? Shapik: The Quest, a darling point-and-click adventure by Pavel Podberezko, starts out in just this manner. Now you and your faithful bee companion must set out on an adventure to rescue her. Click to walk or to interact with your environment, and watch your cursor for changes that indicate an interactive area. It's important to note that sometimes you have to walk to a different part of the screen before you'll be able to click certain hotspots. It will also occasionally be up to your bee to get to things out of your reach, so experiment until you find your way to the next level. The developer lists inspiration from Machinarium, though Samorost deserves a nod as well. The visuals and artwork are lovely, and the soundtrack enchanting. 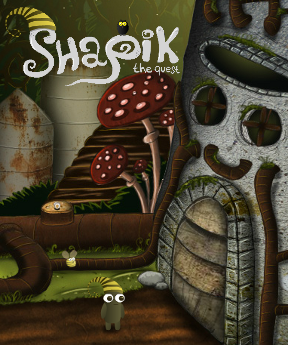 Though short, Shapik: The Quest is a wonderful way to sidetrack your day. Shapik: The Quest Walkthrough now available! Click on the rock where indicated to walk that direction. Click again to pull the vine. Click on the rolled up vine to bounce up to the branch. Click on the creature trapped in the spider web to walk to it. Click again to free the bee. Click on the topmost mushroom to send your bee to free the vine. Click on the vine to climb to level two. Walk to the right until you're standing by the old man. Click to talk to him. He wants part of his switch that was stolen by the owl. Click on the owl, and your bee will scare it to a different branch. Click on the fruit above the owl's head, which will startle the owl and cause it to drop what you're looking for. Click on the missing part to walk to it, then click again to pick it up. The old man will install the missing part into the panel. Click on it for a close up. Click the blue and green parts so they are in a vertical position to turn on the lights. Click on the arrow on the right side of the screen to exit to level three. The bridge is too high for you to cross. You need to find the code to lower it. Click on the tuft of grass and cat tails on the bottom of the screen. Click again to pull up a sign post. That arrow is pointing up! We want down. Click the sign again to flip it around. That's better. The code is yellow, green, purple. Push the red button after you enter the code. Walk until you are standing by the frog. Click the frog. Continue walking until you are standing by the one-eyed creature. Talk to him to find out his friend the snail got scared off. Walk back to the bridge by where the frog was. Click on the snail. Click on the right side of the screen to exit to level 4. Click the up arrow to summon a tram. Notice the worm that peeks out when you're in the tram. Jump out and then right back into the tram and the worm will come out, causing all sorts of commotion. You can now click the down arrow to take a ride to level 5. Watch the cut scene to continue on to level 6. Walk until you are standing in front of the door. Click to knock on the door. Notice the guard with the key that appears in the top window. While the guard is in the window, click on the key and your bee will retrieve it. Walk to the middle of the screen. Click on the manhole cover to walk up onto the pipe. Click on the crane to climb inside. Click once on the right arrow to move the crane above the manhole cover. Click on the blue down arrow to lower the crane, then push the up arrow to pull the lid off. Welcome to level seven! Wait until the robot is below you. Click on the green button to leak water out. It will short the robot out. Click the button two more times until a code starts flashing on the robot screen. Walk to the center and then click down the ladder. Walk to the door on the right and click on it to view the code interface. Enter the code flashing on the robot, starting with the equal sign. Click the door to enter level eight. Walk across the screen and click the red button to call the elevator. Click on the elevator to get on. Click the red button to ride up to the next level. Click to exit the elevator, then walk to the left until you are standing next to the bulliten board. Click on the bulletin board to look at the papers. Whoops! One fell off! But the one that stayed reads 314. Ride the elevator until you are back to the ground floor. Walk over to look at the fallen paper. It reads 425. Go back to the elevator and ride to the second floor. Walk to the panel in the middle of the screen. Click on it for a close-up. Think of the numbers you found. Click the first button 4 times, the second 2 times, the third 5 times. The light on the left side of the console should glow red if you've done it correctly. Click the red button to clear. Click the first green button 3 times, the second 1 time, and the third 4 times. Another panel should open if you've done it correctly. You'll notice the dials in this panel are similar to the drawings on the wall. Pay attention particularly to the right side wall. Make the blue lines match the lower line of the symbols on the right. Go to the elevator and ride up to meet your sister! Enter the room she was in and click on the computer. Click on all of the arrows one time (i.e., highlight the arrows pointing up) so the elevator will take you up. Walk to the elevator and push the button to escape to level 9! Click to walk across to the chained bug. Click on the bug who tells you he'd greatly like the key to his chain. Walk back to the center of the screen, then click on the foot of the stars, then on the stairs to go up. Click on the unoccupied bed to hide. Click on the monster. Your bee will bother it and it will sit up and turn on the light. Click on the monster again while the light is on. It will swat the bee away, turn off the light and roll over, revealing the key. Click on the key to take it. Click on the chained up bug to free him. He'll bring you your escape ride. Click on the stairs to walk down, then on your sister, then on the door of the flying machine until you are in it. Click one last time on the flying machine to win the game. Congratulations! the leftmost one was horizontal. I'm not sure which way it was pointing, but I think it was 3 clicks from the way they started. The clue for how to set these is just to the right of where your character stands during this puzzle. On the very right of the machine is a dial with a blue mark pointing upwards. It's faint and small. Follow this left a bit and there are 4 drawings of dials in a row (you want the bottom one) and this gives you the correct settings. Even though it was undoubtedly heavily inspired by Samorost, not just in the visuals but in many of the sound effects, it still managed to have its own personality. A really, really cute one. I don't get level 8 either. I don't see any hints (writing on the wall). Okay, I see it now. Thanks sonicscrewdriver. they should have the blue part of the switch pointing, from left to right, East West East North. Or 1 click, 3 clicks, 3 clicks, 2 clicks. Cute game, but annoying to play. Having to walk to specific places to even be able to interact with some things wouldn't be bad if it would walk all the way to where you clicked rather than walking partway there and stopping so you have to click again and again. There was no logical reason to require me to enter one of the codes before the other, so I wasted a bunch of time trying to enter 3-1-4, trying out various interpretations (count the first click, don't count the first click, etc.) until it seemed to accept it; and then I wasted some more time trying to enter 4-2-5 before giving up in frustration and reading the walkthrough, only to find out that you have to enter 4-2-5 first. I am in LOVE with this game, it is so beautiful! I especially liked that it is not predictable and that you have to find the right way on your own. Some point and click games are "self-walking", Shapik is amazing! I managed to finish without the walkthrough, bug thumbs up to Pavel - the creator! I'm excited to play more games with Shapik! Thanks!! Now I'm working on the next game. Good to hear! Please let us know when it's done! I thought shapic was really cool, though level 8 left me yearning for a higher IQ,I look forward to your next game. And thanks for making it free! Great job!! ..."litchie"